It’s 10 p.m., and the already quiet Davidson River Campground has been completely muted by the steady whoosh of rain pelting our tent. Through some on-the-fly engineering, we’ve avoided the potential doom of a couple minor leaks. Settling into a movie in our cozy monoplex (with the help of a laptop), we’re drying out from a day spent exploring the waterlogged trails of the Pisgah National Forest and warming our insides with a flask of bourbon. Sure, bluebird days make for idyllic lunch spots, and a sun-soaked afternoon landscape is the stuff of photographer’s dreams. But exploring this area of North Carolina’s second largest National Forest in the rain has its own charms. 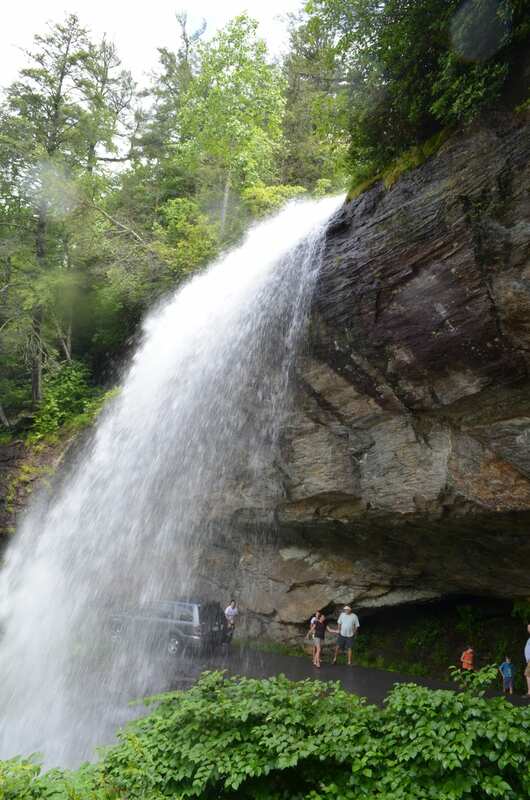 Here are 4 reasons why your long-awaited visit to Pisgah doesn’t have to be a complete washout when wet weather is in the forecast. 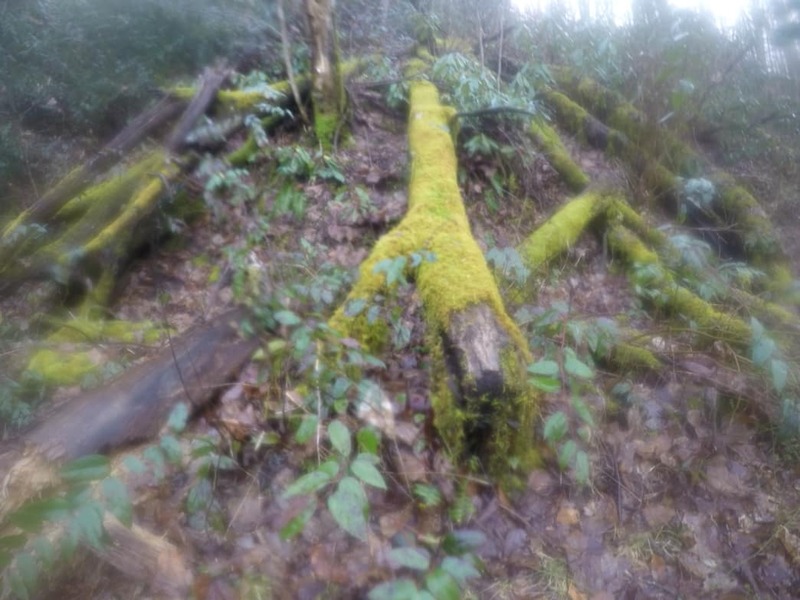 Mossy logs, brilliantly green, stand in contrast to a gray day. Like a heavy blanket, dense fog tamped down any movement, creating an eerie stillness in the forest. Mountain laurel seemed to edge closer to the trail while towering hardwoods, their tops barely visible through the mist, stood silent guard. Ancient Appalachia is full of secrets, and it’s never more mysterious than when clouds settle low among its peaks. When visibility sits at around 4 feet, the million-dollar views from legendary destinations like Shining Rock don’t hold quite the same magnificence. 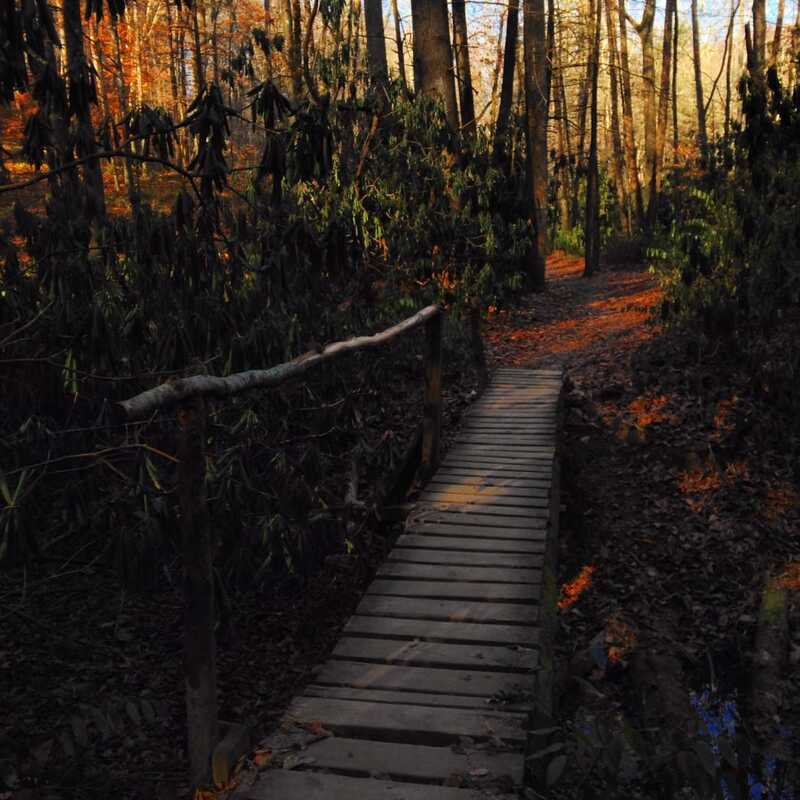 But these days are tailor-made for a more intimate exploration of Pisgah’s heavily forested trails. The easiest to access hike begins right from the campground. Look for the trail kiosk along the main campground road, and just next to it lies the North Slope trailhead. This 3.7-mile loop is, at times, a rugged mountain trail and, at others, a gentle walk along the Davidson River. About halfway around, the North Slope Connector links to the famous Art Loeb Trail. To create a 7-mile loop, walk out on the North Slope and return via the Art Loeb. This is a favorite for area trail runners. For a chance to enjoy one of the most popular hikes in the park, sans crowds, talk a stroll through the ominously named Graveyard Fields. The burnt stubs of trees left behind by a devastating fire nearly 100 years ago gave this area its moniker. A wet, gray day puts the green valley in a contemplative mood. Looking Glass Falls thunders under rain swollen skies. All the water that was collected at the top of Pisgah’s peaks during this shower make a mad dash to lower ground. This mass aquatic exodus creates waterfalls that don’t exist on dry days and turn gently flowing cascades into dramatic, thundering cataracts. 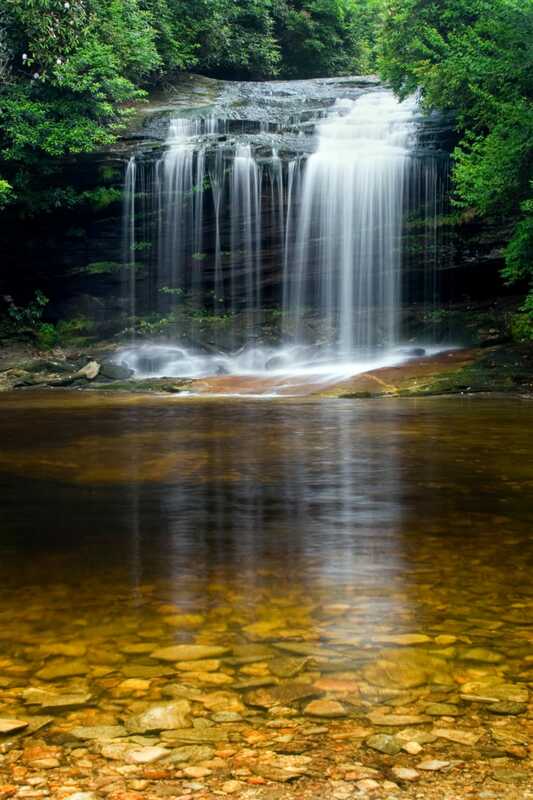 Three beautiful examples lie just a few miles up the road from Davidson River Campground. 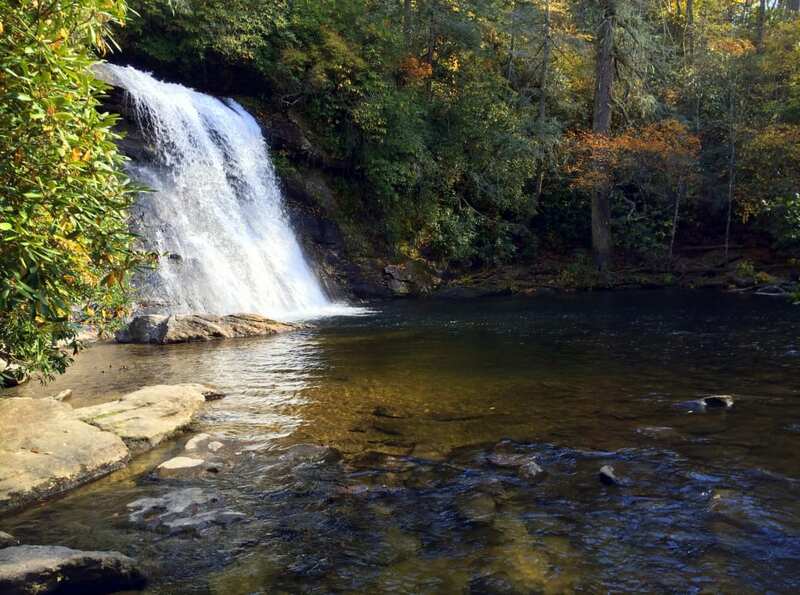 The broad, 60-foot plunge of Looking Glass Falls is probably the most popular waterfall in the park. The roadside attraction, available for closer inspection via a set of stairs to its base, holds a significant flow year-round. After a good storm, though, the pile-driving force of water can be heard for miles around. Keep driving up 276 and you’ll soon see the entrance to Sliding Rock. There is a fee to park here during peak season but not in the winter. Those familiar with this 60-foot natural water slide will notice a decidedly different temperament after a significant storm as it morphs from Sliding Rock to “shove you violently down a river” rock. While it’s not safe to slide, it is an amazing transformation to view. 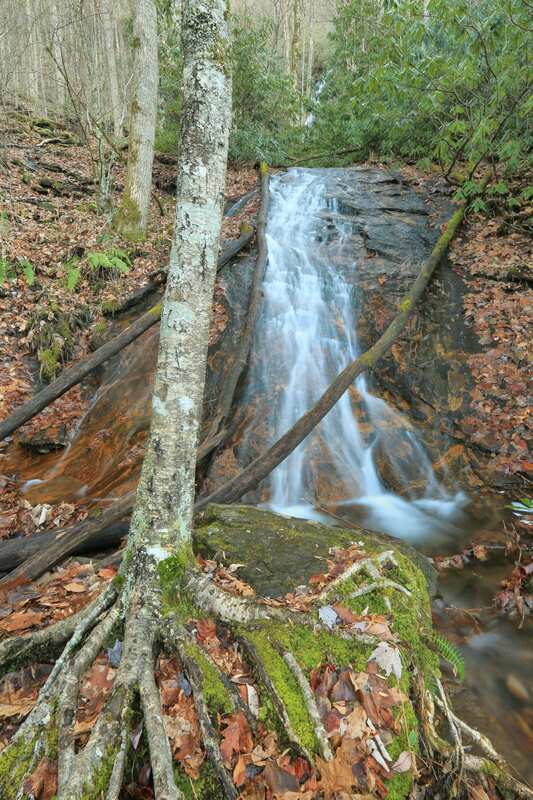 Between Looking Glass and Sliding Rock, the walk to Moore Cove Falls is one of the most pleasant in the park. Spring and summer wildflowers peak though a carpet of fern, all of it shaded by stands of yellow poplar. But that’s nothing compared to what waits at the end of the easy, .75-mile trail. Falling 50 feet over the edge of the broad but shallow cave, Moore Cove Falls completely envelopes the senses. Surrounded by forest in every direction, there is no better immersion into Pisgah than this spot. Trumped up by excess water, the normally gentle, wispy falls only become more dramatic in the rain. A cozy tent is made cozier by the melodic tapping of a rain shower. 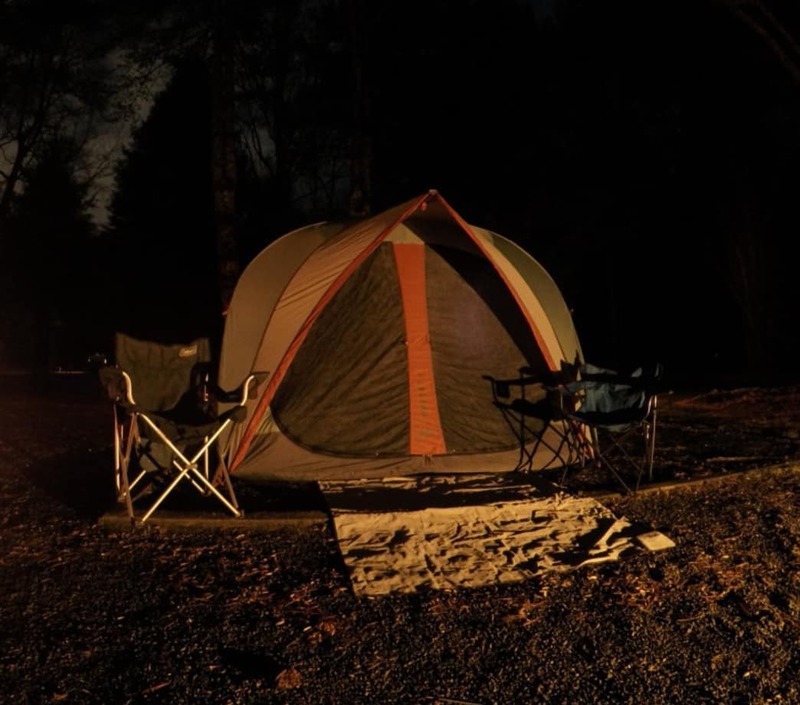 Davidson River Campground is one of the best appointed government-run facilities of its kind in the area. And that’s no secret. It’s typical of fair-weather weekends to see every reservable site booked weeks in advance. The non-crowded bathrooms and extra quiet that follow a dodgy forecast may have you doing a rain dance. Perhaps the greatest features in the campground, particularly during inclement weather, are the heated bathrooms. The warm showers are operated by timer button and require about 56 pushes to remove 3 pounds of muddy trail that’s stuck to your legs. But after a one-legged “don’t let my clean pants touch the shower floor” dance, slipping into a fresh set of clothes is a comfort beyond compare. 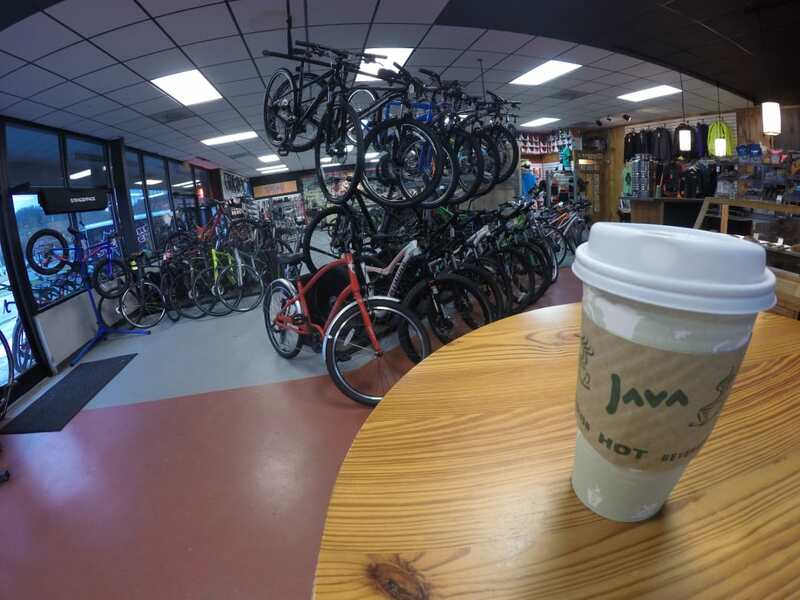 Crank Coffee is the perfect place to ride out the storms that keep you from riding the trails. Lacking pretension and oozing southern mountain-town sensibility, Brevard, North Carolina, has avoided much of the over-done kitsch that sometimes permeates such a well-located tourist town. The restaurants, from gourmet to pub-grub, are cozy and inviting but rarely “fancy.” A 10-minute drive from the campground, Brevard is a quick escape. Hot java and cool conversation are just down the road at Crank Coffee. Home to both fat tires and skinny lattes, the bike shop/coffee café is as laid back as you can get. Grab a soul-warming mocha and browse the selection of mountain and street bikes. With free Wi-Fi, hot soups, and tasty pastries it’s a great place to ride out the storm when you can’t ride on the trails. Conversations at Brevard Brewing echo through their large, simply ornamented tasting room on Main Street. The beers aren’t wild or eccentric—you’re not likely to find a stout that tastes like pretzels or salted caramel anything on the menu. But each option is true to style and easy to sip. Best of all, you’re only a few steps from multiple dinner options. You’ll often be greeted by Big Mike when you pop into his namesake eatery in downtown Brevard. Even on busy nights he’ll stop to chat up the guests and talk his favorite topic—pizza. The brightly lit restaurant serves pies from a stone oven. Crusts are hand-tossed, medium-thick New York style with a decent crunch on the edges. The beer selection isn’t huge, but the list of local and craft brews offers enough variety to please most anyone. While the rain gushed outside, we decided to delay our return to the campsite with a stop in The Phoenix for a nightcap. Just next door to Big Mike’s, we didn’t even need to put our rain jackets on to get there. The farm-to-table gastropub is a fantastic choice for a meal, but the cozy couch with faux fireplace was also a fine location to warm up with a cocktail. After a night’s steady deluge, we woke to find that our tent was now on the shores of the newly formed Site 43 Lake. The morning sun dried out our gear while we hiked a quick loop. While we certainly missed the campfire, seeing the forest in a whole different light was a pretty good trade-off. New year, new you, right? Nah, you’re doing just fine—no need for a complete overhaul. 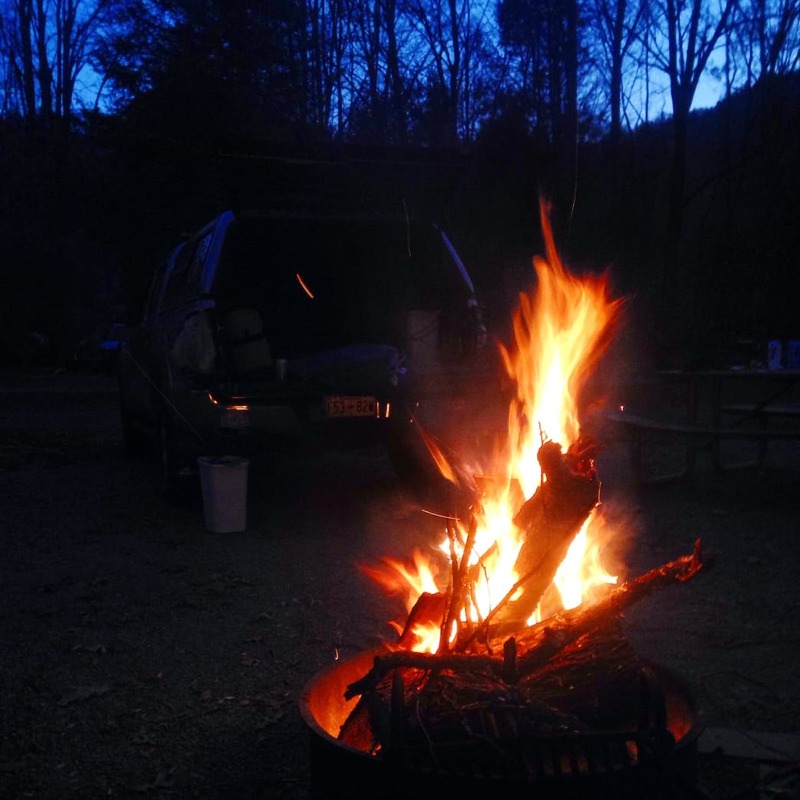 If you live around Asheville and you love spending time in the outdoors, then you’re probably a happy camper. However, the start of a new year does provide the perfect opportunity to introduce a few new challenges into our already adventurous lives. Here are five New Year’s resolutions for more outdoor adventure in Western Carolina that will help keep you healthy, wealthy (in terms of experiences, anyway), and wise. 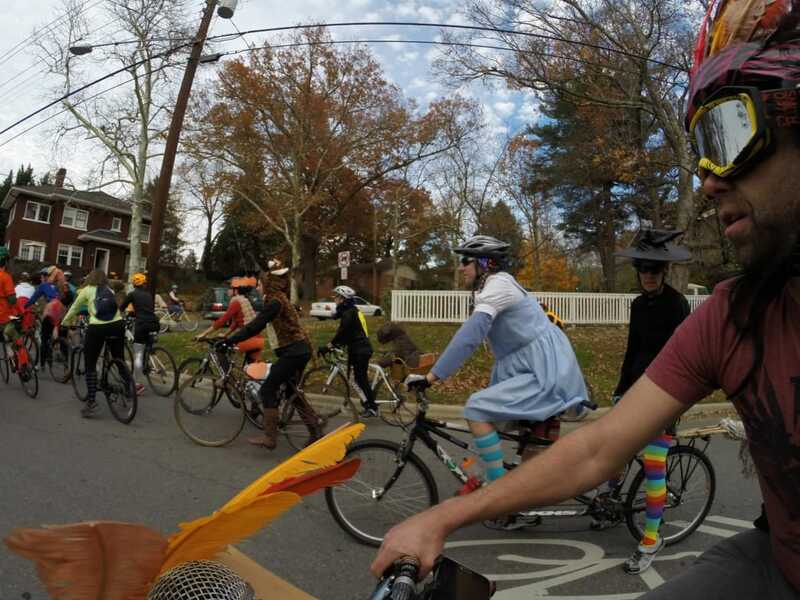 A community ride with Asheville on Bikes, Asheville's premier cycling advocacy group. Many local organizations come with social perks, like attending Bike Love withAsheville on Bikesor spending a day maintaining trails with Pisgah SORBA. Check out Carolina Climbers Coalition, Southern Appalachian Highland Conservancy, American Whitewater, or choose from a list of fantastic local orgs that you can support in a variety of ways. A heavenly winter trek on Mt. Mitchell. Winter in the Blue Ridge is not to be missed. Resolution lore informs us that in order to turn something into a habit, you must do it every day for 21 days in a row. So button up your jacket, set the alarm an hour earlier, or equip yourself with reflective gear for your evening jog, because January is going to be the most challenging month of the year to get outside. Once this first cold month passes, however, getting outside every day will have become a habit, one that will benefit you for the rest of the year. That’s right: This year resolve to spend some time in the great outdoors every single day, regardless of weather, your packed schedule, or your burning desire to settle in and watch Netflix for the evening. Some days, you may find yourself exploring frozen waterfalls in DuPont State Forest, running the quiet trails in the Pisgah, or breathing in the sharp winter air on the summit of Mt. Mitchell. More often, your daily adventure may be closer to home: exploring the winding trails at Bent Creek or Richmond Hill, or pausing for a moment beside the river at Hominy Creek Park. On other days, the extent of your excursion may be a taking a walk around the block: as long as you’re outside, breathing fresh air and moving your body, it counts. 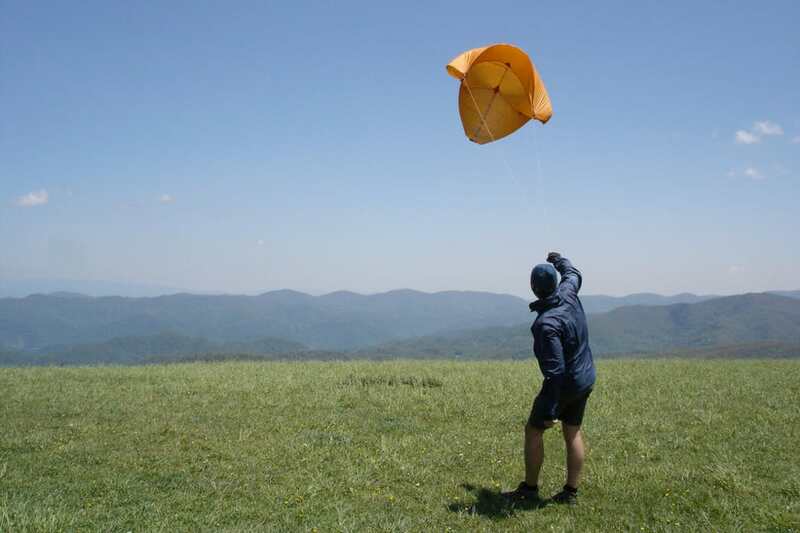 Kite flying on Max Patch may not be the most extreme sport…and that's why we love it. Hey, we get it. You live in Western Carolina because it has the best whitewater/mountain biking/trad-climbing/etc. Why would you ever spend a day outside doing anything but your pastime/obsession of choice? 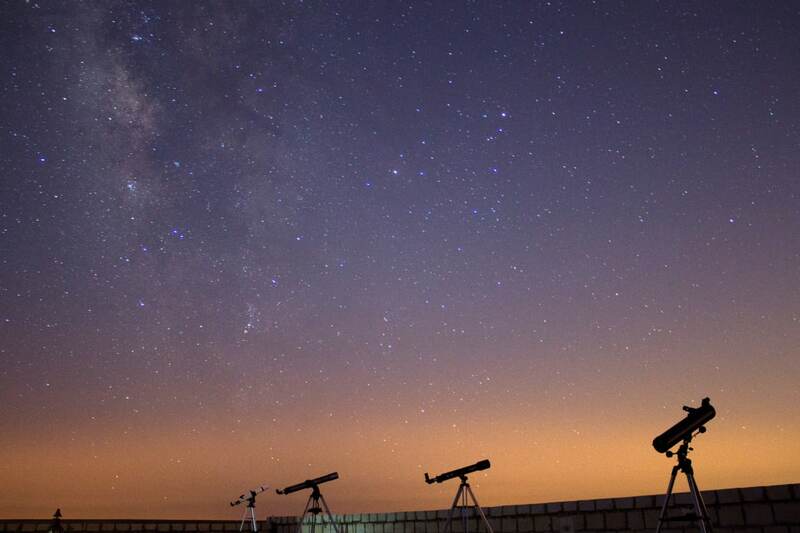 Actually, there are a few compelling reasons to try a new outdoor venture, just for the fun of it. For one, it can be a soft way to introduce someone in your life to the outdoors. (For the record, teaching your hapless coworker how to roll a kayak in the river in February….not a soft intro.) 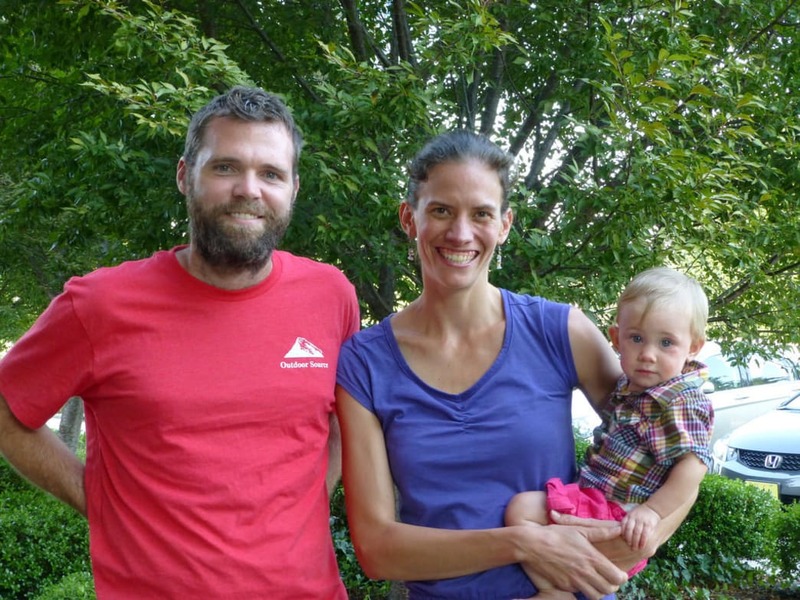 Grab your brother, neighbor, friend, anyone who has expressed interest in getting outdoors but is not sure how to begin, and invite him or her along as you try out some of the adventurous fun Asheville has to offer. Another great reason to try your hand at a new activity: Science has proven that developing new skills and approaching new challenges benefits the neuroplasticity of the brain. This can lead to a boost in creativity, adaptation, and problem solving….all useful skills when you’re faced with an unrunnable rapid at the bottom of a canyon as night falls. Just think of it as cross-training for your brain. So get out there: go zip lining or tackle a canopy ropes course, cruise the Blue Ridge Parkway on an electric trike, see whatgeocaching is all about, try SUP yoga, or bring a kite to Max Patch. Leave the training logs, mapping apps, step counters, and your insatiable appetite for adrenaline at home, and allow yourself to just relax. At least once. That’s not too much to ask, is it? Sunrise from Rough Ridge, just off of the Blue Ridge Parkway, is a spectacular sight. So most people at one point or another in their lives have resolved to watch a sunrise in the new year. 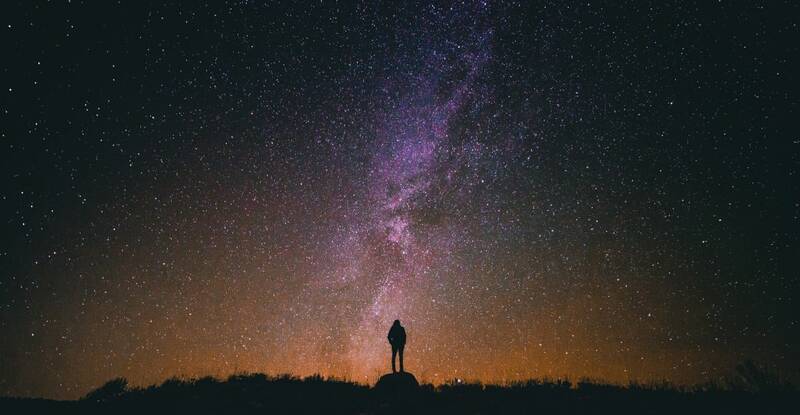 There’s something about the promise of new beginnings, the lure a blank slate and that expansive feeling of limitless opportunities that accompany the dawning of a new day that perfectly matches the hopeful sentiment of New Year’s Resolutions. As dawn patrollers, campers, photographers, and explorers, we’ve probably seen more of those delicate first moments of light than most people. This year, we challenge you to not only seek out a sunrise, but seek out the ultimate sunrise. Consider this your mission. You may need to do a little research (or let us do that for you), study a map, scrutinize those contour lines, and stake your claim. 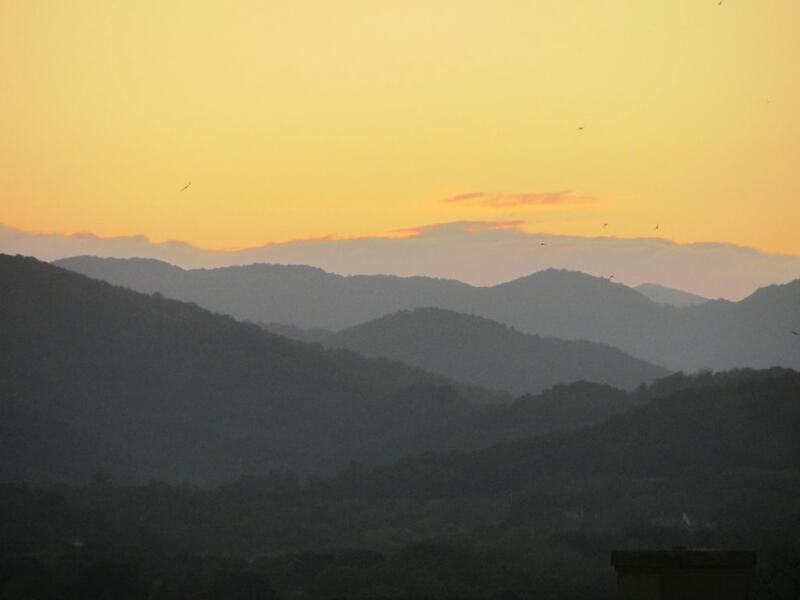 The top of a firetower, the spindly summit of Chimney Tops, local hikes that are renowned for their views and vistas…these are all optimal places to enjoy some serious atmospheric refraction. You may have to spend the night out, but that’s half the fun. Tuck away every excursion, and watch your adventures accumulate. 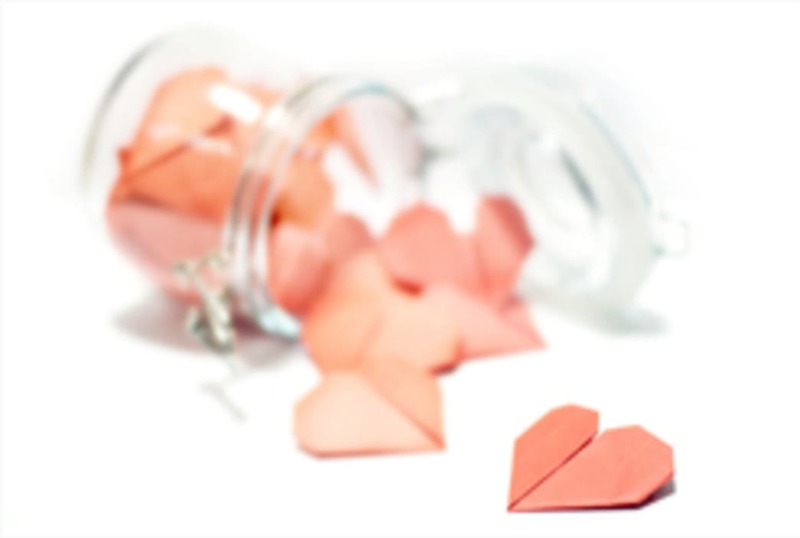 In an age where positive thinking and gratitude are dominating pop psychology, the inspiration jar has become a popular New Year’s practice. Traditionally, people record one positive thing that occurred during each day on a slip a paper, and store the slips inside a clear glass jar. As the year progresses, it’s satisfying to observe the happiness accumulate. As adventure lovers, why not try an outdoor spin on the inspiration jar? Every time you complete a new trail, visit a new waterfall, claim your first descent of a river, tick off a route at the crag, or run one mile further than you have before, write it down and store it in the jar. Adding to your collection of accomplishments can feel a little bit addicting, and it could be just the motivation you need to head out of doors on a grey winter Saturday. Save the pleasure of reviewing them all until next New Year’s Day. Why waste the winter months hibernating indoors? Snow, ice, and frosty temperatures provide plenty of fodder for outdoor adventure. When winter weather rolls into the Southeast, North Carolina’s wild spaces are briefly and beautifully transformed—with much more to offer beyond black diamond downhill runs. Requiring far less finesse than downhill or cross-country skiing, snowshoeing is ideal for ski school dropouts, and sturdily-built snowshoes can go places skis can’t. In the High Country just north of Boone, Elk Knob State Park consistently gets a more-than-generous dusting of snow. Even better, the park remains open throughout the winter, meaning after a coating of fresh powder, Elk Knob’s trails are prime for exploring by snowshoe. While snowy forecasts may keep drivers off roadways, predictions of wintery weather will have cross-country skiers chomping at the bit. When snow and ice render North Carolina’s most stunning roadway—the Blue Ridge Parkway—inaccessible, at times, for vehicles, the thoroughfare is transformed into an extensive Nordic track for cross-country skiers. The High Country section of the parkway skirting Grandfather Mountain between Blowing Rock and Linville is beloved by local Nordic enthusiasts. Near the parkway’s southern terminus, the stretch of roadway around Soco Gap can also become skiable, and it is loaded with close-ups of the frosty peaks of the Great Smoky and Plott Balsam mountains. Just off the Blue Ridge Parkway (milepost 292.7), the more than 20 miles of carriage-roads lacing the 3,500-acre Moses Cone Memorial Park morph into Nordic wonderland with a blanketing of snow. Some crags are better in winter, including some of North Carolina’s premier routes, which are best tackled after autumn’s crisp chill arrives. Slopes that are too toasty in spring and summer become climbable. Rising dramatically above a thickly wooded expanse of the Pisgah National Forest,Looking Glass Rock, just a few miles outside Brevard, is one of the largest monoliths in the country, providing unparalleled climbing opportunities. The massive granite dome is best climbed in fall and winter. For bouldering aficionados, Looking Glass also has plenty of problems, primarily collected along the base of the North Side of the monolith, accessible along the North Side Trail. 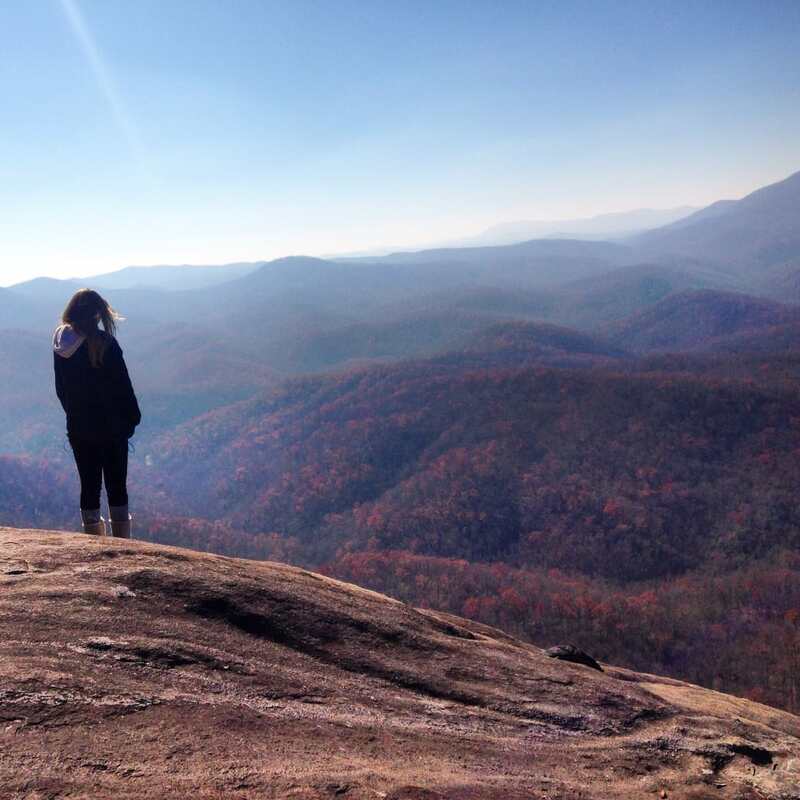 Southeast of Asheville in Chimney Rock State Park, the southern cliffs of Rumbling Bald make for another ideal winter climb, and the Rumbling Bald Trail also meanders past three boulder fields loaded with nearly a thousand problems. Tackle the terrain with the recently published *Rumbling Bald Bouldering Guidebook *by Chris Dorrity. Head for North Carolina’s most popular trails when temperatures plunge, and less hearty hikers have gone home to roost for the winter. Waterfalls are among the state’s most popular hiking destinations, and in winter, most cascades are equally stunning, transformed into gravity-defying ice sculptures. 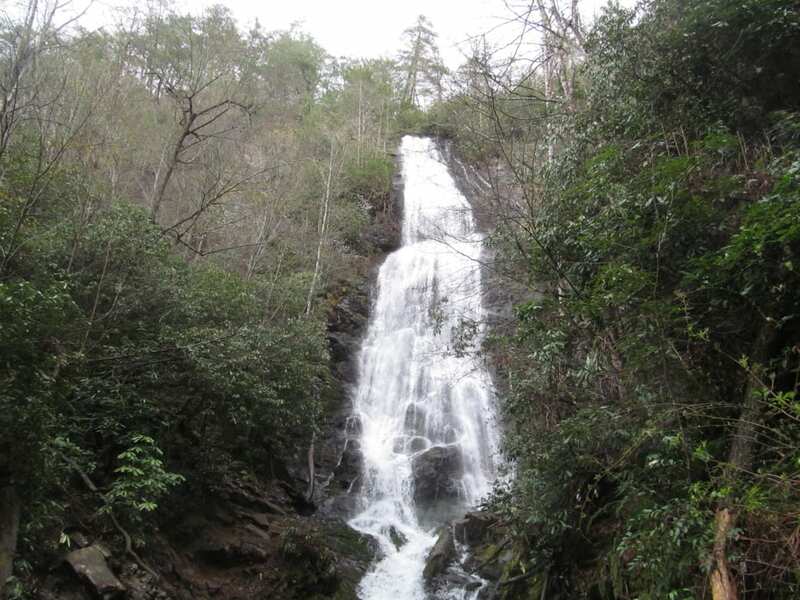 Outside Brevard, head for Moore Cove Falls, in the Pisgah National Forest, accessible after a brief 0.7-mile hike. 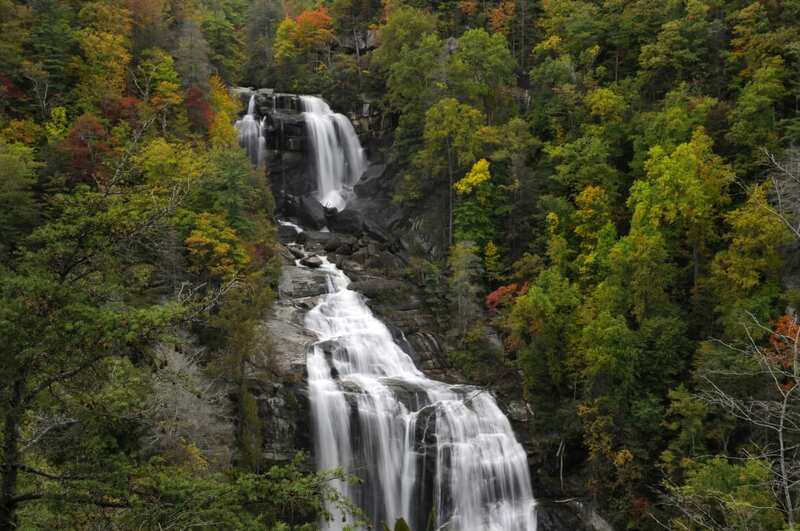 Or strike for the state’s most popular flume, Linville Falls. You can hike there via the trails that begin along the Blue Ridge Parkway (milepost 316). 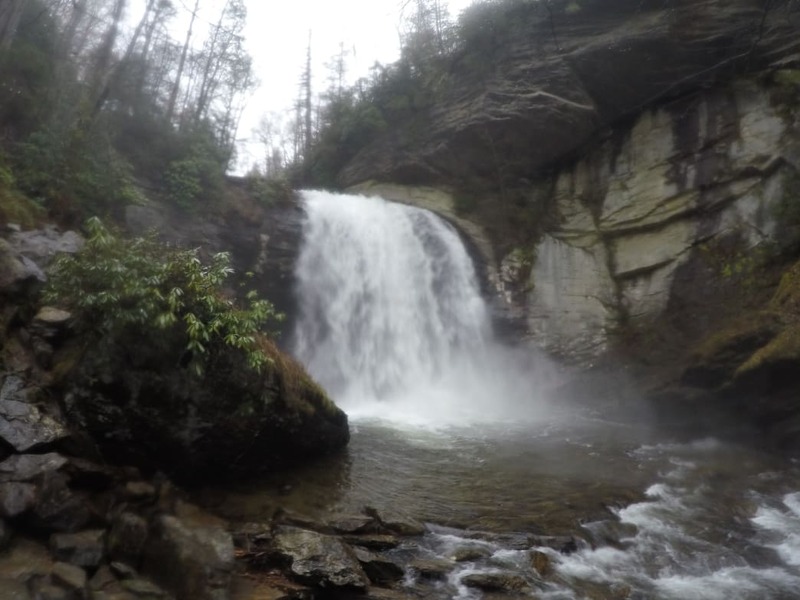 Even when the parkway is closed for winter weather, the falls are still accessible courtesy of trailhead located off NC 183 (on Wiseman’s’ View Road, NC 1238), outside the town of Linville Falls. During icy winters, the land of waterfalls becomes a frozen wonderland, making North Carolina of the best ice climbing destinations in the south. For novices, Fox Mountain Guides operates in the Pisgah National Forest and offers expert-led trips. North Carolina is the only state aside from New Hampshire where the climbing school offers ice-scaling expeditions. 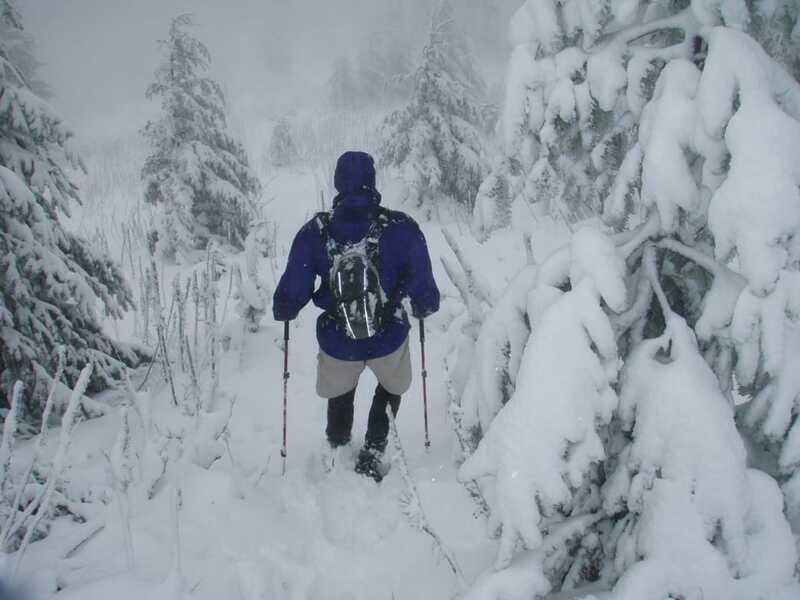 For experts, when wintery conditions prevail along the Blue Ridge Parkway, the ice-glazed bluffs and crags of Doughton Park (milepost 240), provide an abundance of climbing options, including tackling the rock ledges framing the iconic roadway (climbing is permitted when the parkway is closed to vehicles). In the Nantahala National Forest, just outside Cashiers, the soaring cliff faces of Whiteside Mountain appear glazed with ice year-round. However, when the cliffs truly are iced over, Whiteside is transformed into one of the East’s top destinations for unflappable, peak-bagging pros—with options like Starshine, an iconic 200-foot route. Winter camping makes for a singular outdoor adventure. Familiar landscapes can take on a different dimension—and present new challenges. 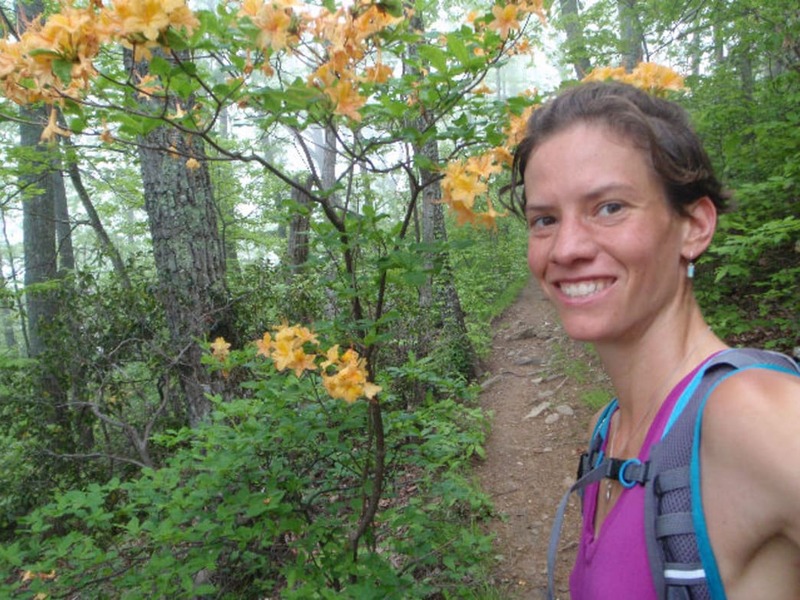 Tackle a bite-sized thru hike in western North Carolina on the 30-mile Art Loeb Trail, rambling through the Shining Rock Wilderness and over some of the loftiest peaks in the Black Balsam mountains. The trail can be broken up into shorter sections for backpackers wanting to cut their teeth with a quick winter overnight. 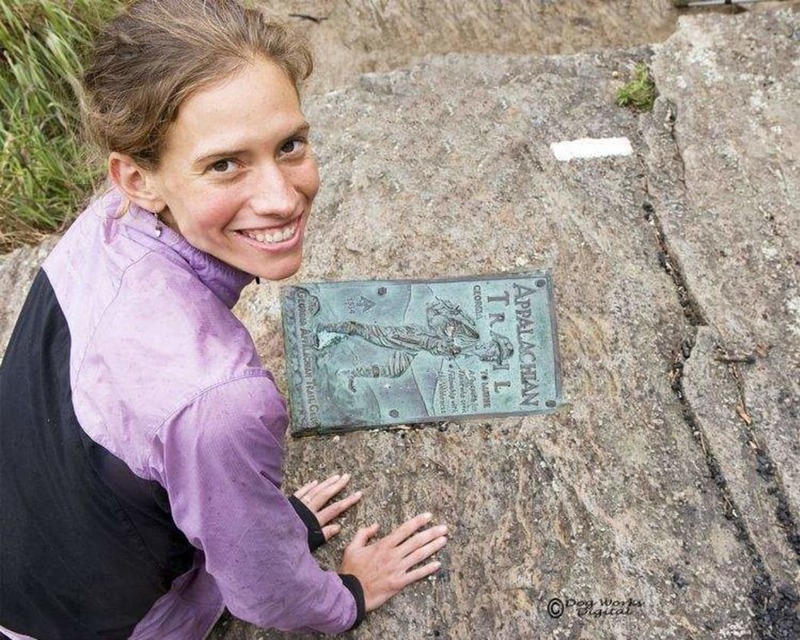 For ambitious backcountry snow-bunnies, the Bartram Trail, named for 18th century naturalist William Bartram, winds through North Carolina and Georgia for 100-miles, mingling with the Appalachian Trail several times. 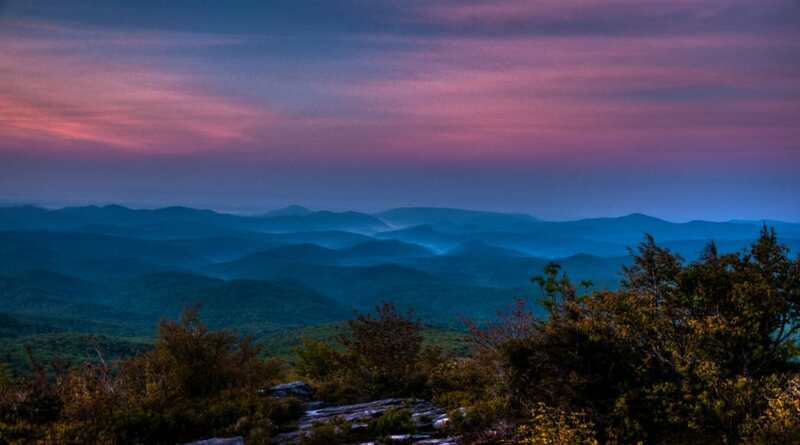 The western North Carolina stretch rambles through pristine expanses of the Nantahala National Forest, culminating at the summit of 5,062-foot Cheoah Bald.